After a very long night's sleep and still many children asleep past 7 o'clock, we had another lovely breakfast and got our rooms all tidy and ready to be left. This was easy for some very tidy children but I'm sure as you parents can understand, tidying rooms is not the strongest point for some children! We set off for a visit to Castleton Visitor Centre Gift Shop and following that, we set off on a circular walk round to Hope and back to the youth hostel. The children walked very well again, we found time to enjoy a great jumping (or splashing in some cases) puddle and had a very enjoyable walk along the river. We had a quick lunch in Hope and were soon on our way to the hostel where we are now enjoying a final biscuit, drink and gathering our belongings before we head home. Jessica K - "I liked going on the walks up the big hills." Mia Re - "I liked learning about all of the history of the local area." Louis - "I liked the egg rockets." Tom - "I enjoyed finding the gems in the sand." Layla - "I'm glad I found the confidence to climb up Mam Tor." Lucie - "Touching the trig point on top of Mam Tor." Henry - "Doing the den building, my team won and we even made a swing!" Miasee-Lou - "I liked getting DOWN from the hill!" Jessie - "I loved the fire, den building and using a spark to make my own fire." Thomas - "I liked making the bread." Goodness me, what a windy, wet, wild, WONDERFUL day! After a somewhat sleep-filled night, the children got ready superbly and had a delicious breakfast before setting off on our morning walk. We were headed to the highest peak of the local area, Mam Tor which looks over the Hope Valley. We set off and saw the peak still covered in cloud following a misty morning but made good pace to escape the village and start to make our ascent. The weather was pretty fierce, temperatures around 6 degrees but the biting wind really stung us on our way up. The children showed great resilience and positivity in slowly mounting and 'conquering' the mountain, you will see from the photos that it was a hard slog but we were all proud to have made the summit by around 11.15. After a quick photo we turned and went back down the same route to return towards Castleton. We stopped off and enjoyed our lunch at Treak Cliff Cavern Visitor Centre before heading back to the hostel. We had a (slightly later than planned) tea and are currently enjoying Captain Underpants in our Movie Night with many very tired children, I'm sure they will all (cough cough) sleep well tonight! What a great day! We arrived at the hostel just after 11 o'clock, unpacked the bus and were greeted by Molly. 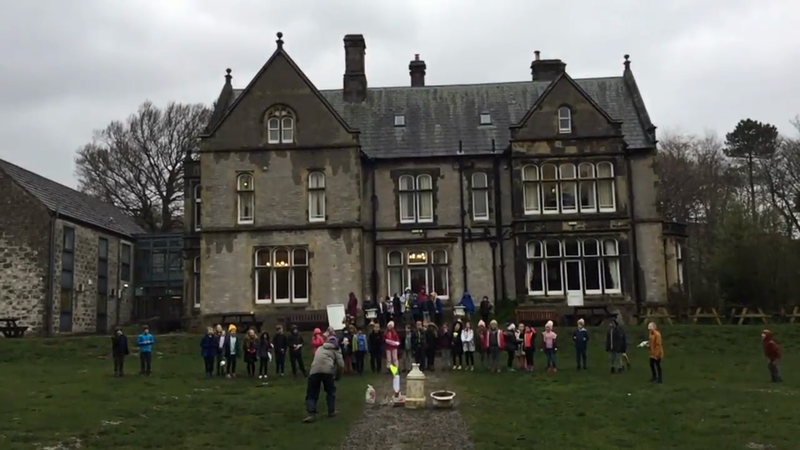 After a couple of safety talks and a quick bite of lunch, we got stuck into our first set of activities; either a GPS tour of Castleton, Hat Game and Egg Rocket construction session or Bread making, Fire lighting and den building and fossil hunting. 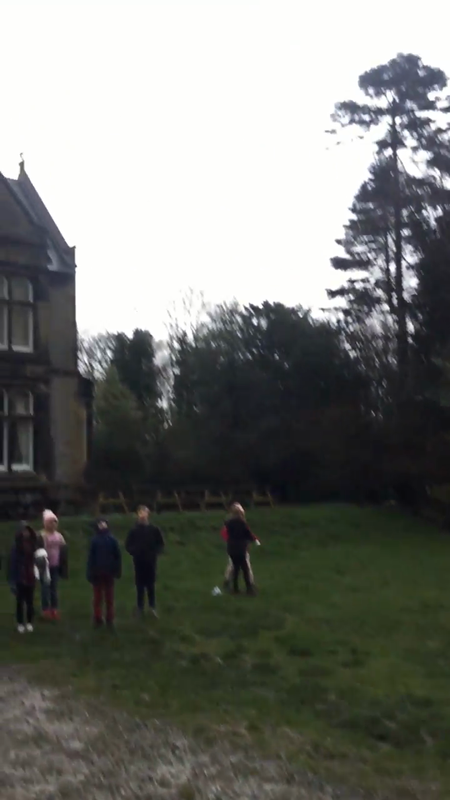 The group who went around Castleton had a race around certain pre-chosen points around the village. Alison (our leader) and her team won the race around the village much to the other teams's disappointment. During the Hat Game (check out the photos!) we discussed roles of different people in and around Castleton and how all people add things to the community. We built our rockets ready for the great launch tomorrow afternoon with some superb designs and teamwork being shown, we are all excited to see how we fare tomorrow. Some children are currently sleeping but not quite everybody, I'm sure it won't be long until we are ALL fast asleep and dreaming!